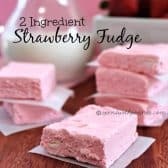 This is a super simple and delicious fudge that just takes a few minutes to put together! Not only is it delicious but it’s so pretty! Line 9×9 pan with parchment paper or tin foil. In a small bowl, microwave candy melts on medium at 30 second intervals. Stir and repeat until smooth! Add in frosting and stir until combined. Pour mixture into prepared pan and spread smooth (you can add sprinkles on top if desired). Refrigerate until completely set. In this size pan, the fudge pieces are about 5/8″ thick. If you want thicker, make a double batch.